Home Moto Rossi: "It was a good day for victory, but I made a mistake"
Rossi: "It was a good day for victory, but I made a mistake"
Commenting that Rins said he had won his idol, he said: "I am very concerned about this, because those who have ever said this have revealed themselves as the worst enemies." -Again second, as in Argentina. What is the taste of this podium? -For one, I am disappointed because I have not won for so long, but on the other hand, I'm happy because I'm competitive again. Today could have been the day to get the victory, but after Rins happened to me, I made a mistake in braking. -What have you thought when Márquez has fallen? -You can understand. Because when you go to the limit, it can happen. When I saw him fall I thought it was a good opportunity, but I knew it would still be difficult because there were many laps left. I concentrated on driving well and was rolling hard to a certain point. Then Rins has arrived. I tried to push hard in front, but I saw that we could not because he was a little stronger than me. In the last turn, if we did everything perfect, I could try to make a desperate attack, but I have gone a little long in the 11th and there I lost it. But in general it has been a good weekend. -Kenny Roberts has said that it is the most incredible World Cup he has seen. -We are four riders with four different bikes in front, and the championship is very level. Afterwards, there was a bit of a mess with the tires because the weekend has been very busy. For example, Dovizioso, who was very strong, stayed out of Q2 yesterday, had to leave behind and, although in the end he reached fourth position, he was out of the podium ... but you have to recognize the championship so equal because today Marquez has fallen, because if he had not won today and would have much difference ahead. Today Marc and Honda are the strongest. -Is the favorite still Márquez? -For me yes, because in Qatar he did second and in Argentina he has dominated the same as here, that when he has fallen I led with three seconds. So, absolutely yes. 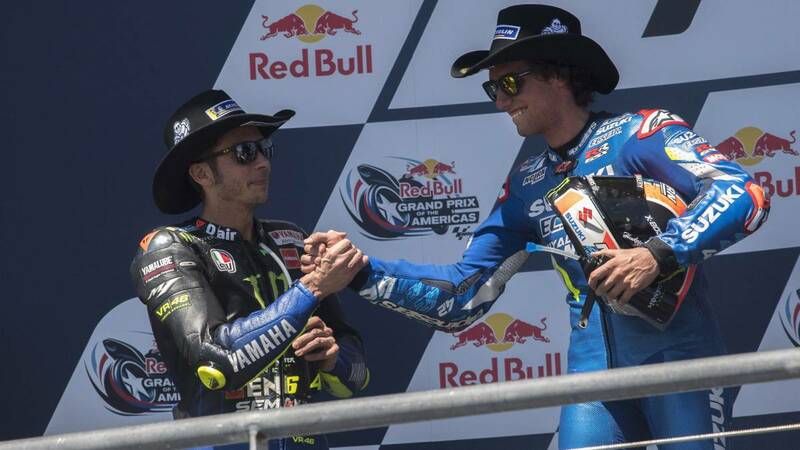 -Rins has said that it has been an incredible battle with his idol. -I am very concerned about this, because those who have ever said this have revealed themselves as the worst enemies. (Laughter) I do not believe it anymore, but it's a pleasure to say it. (More laughter) . -How much room for improvement is the Yamaha? -I'm happy because in the last two years we have suffered. For me, the Yamaha should have the potential to win the World Cup. It is true that we have the engine sealed, but during the season we have many things to improve. We have seen especially that in the last year the Honda and the Ducati have improved a lot during the season and we have stagnated instead. But we are working, there are many new people in Yamaha and the bike is already better. -You are always the best Yamaha. -Honestly, I work hard for that and I'm happy for it.